Would you like to commission an original artwork of a subject that has special meaning for you? 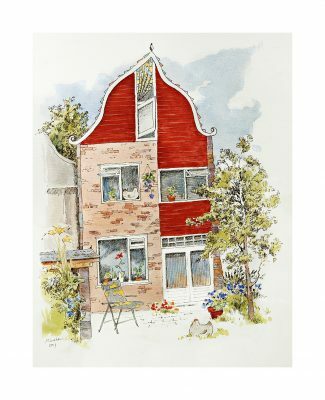 Perhaps a watercolor of your ancestral city, or an ink/watercolor drawing of your family home? I do accept commissions on a case by case basis, as long as the subject suits my style and my skills. After you let me know via email what you have in mind in terms of subject, medium and size (if possible with a few photos attached*) I will send you a price quote and an estimate of the time needed to complete the work. If you accept, I will send you an invoice for 50% of the price. You will pay the remaining 50% upon completion of the work. Your painting will be shipped to you framed and ready to hang in your home, or unframed so you can choose your own frame, whichever you prefer. Shipping is included in the price. Prices do not include mat and frame. If you would like me to provide a mat and/or frame for your painting, I’ll be glad to send you a quote. If you would like a smaller, larger, or custom size painting, please email me for a quote. Please allow two weeks for sizes up to and including 9×12 inches (24×30 cm) and one month for sizes larger than that. I will send you a photograph of the work in progress when it is approximately 50% finished. At this point, I will do my best to incorporate any changes you request. Once the work is finished, you are entitled to one minor alteration at no extra cost. If you require multiple or extensive changes, you pay a surcharge of 15%. 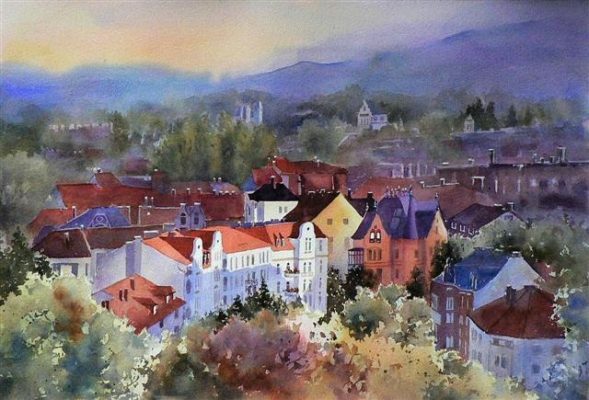 Please keep in mind that there is a limit to how much can be changed in a watercolor before the freshness, which is the medium’s strength, starts to suffer. A payment of 50% is due upon receipt of your order. The remaining 50% will be billed to you upon completion of the work. * If your subject is in the Netherlands and you don’t have any photos, I can also give you a quote of the additional cost for me to gather sufficient reference material on location.